45 ¾” x 35 ½”. Story illustration for “The Saturday Evening Post,” March 13, 1943. Stockbridge, MA, August 9, 2017—As part of its summer lecture and performance series, Inventing America: Art and Cultural Connections, Norman Rockwell Museum will present “Norman Rockwell and the American Ideal: A European Viewpoint” on Thursday, August 17, starting at 5:30 p.m. 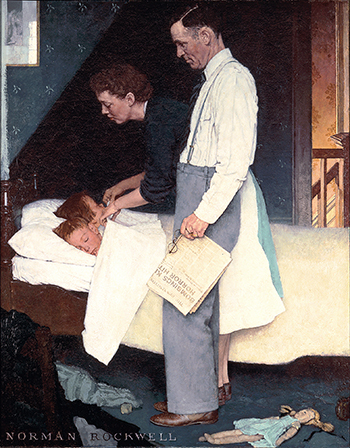 The panel discussion will explore the impact of Rockwell’s work—particularly his Four Freedoms—on both European perceptions of America and on national aspirations. Featured panelists will include Iva Tijan of the University of Zagreb department of Humanities and Social Studies in Croatia; James Kimble, Associate Professor of Communication in the Department of Communication and the Arts at Seton Hall University; and Mark Shulman, a noted educator, academic, and author. The talk is free for Museum members, or included with Museum admission. Iva Tijan is a noted scholar from the University of Zagreb department of Humanities and Social Studies in Croatia where she teaches a course on American Culture and Civilization. She leads the University of Rijeka’s International Relations Office, and her thesis, The Golden Rule: A Picture in the U.S. Attic? was the impetus for this program. Dr. James Kimble is Associate Professor of Communication in the Department of Communication and the Arts at Seton Hall University. His scholarship involves domestic propaganda and the way it helps to construct a rhetorical community even as it fosters depictions of an enemy. The discourse of the World War II homefront draws much of his attention, and he has also published research on the Civil War era and the Cold War. Mark Shulman is an experienced innovator, program builder and academic. Currently he is teaching three interdisciplinary courses: Human Rights at Hunter College, International Law and Human Rights at Sarah Lawrence College and Television News Innovators at Fordham College. His principal academic works examine the relationships between ideas, laws, and international relations. Enjoy this engaging series of talks and performances inspired by our current exhibitions and the persuasive power of visual imagery in its many forms. Free for Museum members, or included with Museum admission. Reservations are suggested. Thursday, August 24, 5:30 p.m.
Thursday, August 31, 5:30 p.m.